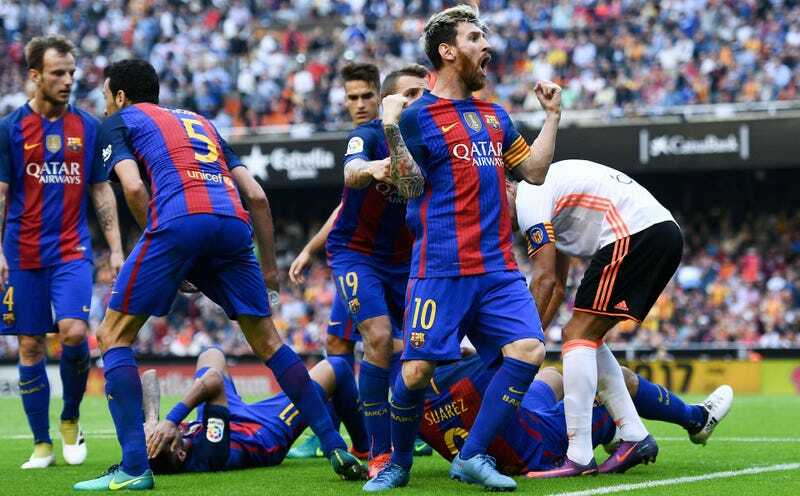 This past weekend, Barcelona scored a last-minute penalty to eke out a critical away win against Valencia. The players were very excited, so they celebrated. The Valencia fans were very upset, so they shouted insults. Neymar in particular took issue with this and yelled something back at the fans. In response, a fan chucked a water bottle at Neymar and hit him in the head. Apparently, the real bad guys here are Neymar and his overly celebratory teammates. You might think this is all pretty straightforward. Barça were under huge pressure to get the win in what had been a hard-fought, emotional match, did get that win in the most dramatic of circumstances, and felt the understandable urge to give back some of the stick they had been taking from the fans all game. You might also conclude that this was all well and good up until the moment one of the fans decided to toss a bottle at Messi and his teammates, as that is never an acceptable thing for a fan to do under any circumstances. “Neymar was wrong to taunt the crowd,” Valencia midfielder Dani Parejo told LaSexta. “The fan was wrong to throw the bottle, but so was Neymar. You see, what we have here are two equal wrongs: the shouting of a few taunts and the throwing of a projectile. And so both offending parties should maybe take equal responsibility, but also Neymar started it, so maybe it’s all his fault in the first place. “You have to go in order and the first and most serious thing is the bottle [incident],” he said at La Liga’s awards night on Monday. When pressed on specifics, he wouldn’t it narrow it down to a particular incident. “I am the supporter that threw the bottle, yes, the one that hit the Barcelona players. From the moment it left my hand, I realised the seriousness of my mistake. “I completely regret it, as it isn’t an act that defines me as a person, nor does it define Valencia’s great fan-base. “When the penalty was given, I felt very impotent and upset at what had just occurred. When Messi scored and came to the north end to celebrate, I also saw how Neymar insulted and provoked all of those Valencia supporters that had supported the team until the end. “At that moment, I saw a bottle lying on the ground, and on impulse picked it up and threw it at them. “It was a water bottle, that despite being practically empty, was enough for not just one but up to five Barcelona players to feign contact. To be sure, no one, not even the bottle-thrower himself, condoned the throwing of the bottle. But you can’t deny that by being too happy, the Barça players were kind of asking for it, and their flopping antics after the toss more or less justified that interpretation. A report released on Wednesday said: “The reproachable behaviour shown by some of the F.C. Barcelona players, who made certain gestures and expressions to the [Valencia] supporters as they celebrated the goal they’d just scored, should not be overlooked. “Nor was it precisely an example of sportsmanship the way some of the club’s players reacted — without having come into contact with the bottle — by simultaneously feigning they’d been struck by the object. “None of the [events] should happen in a sporting competition, which at all times should see mutual respect and fair play between fans and players. “However, the alleged ‘provocation’ referred to by Valencia cannot be used as mitigating circumstances or to excuse [the fans or the club] from responsibility. Certainly the correct tone to strike here. Taking the Barcelona players to task for their behavior leading up to and after the bottle being thrown with some very strong language, while also making it clear that all that reproachable and ridiculous business by the players doesn’t justify or mitigate a violent reaction. Oh and also an incredibly tiny fine with no lifetime or even temporary stadium ban for the fan himself. Everyone learns their lesson. This definitely will never happen again.